Benjamins are proud to present this Five Bedroom detached property situated on a corner plot which is offered for sale with no upward chain and is well maintained. Located in the popular village of Cotgrave, the property has gas central heating, a large en-suite bathroom to the master bedroom and a large separate living room/bedroom five. 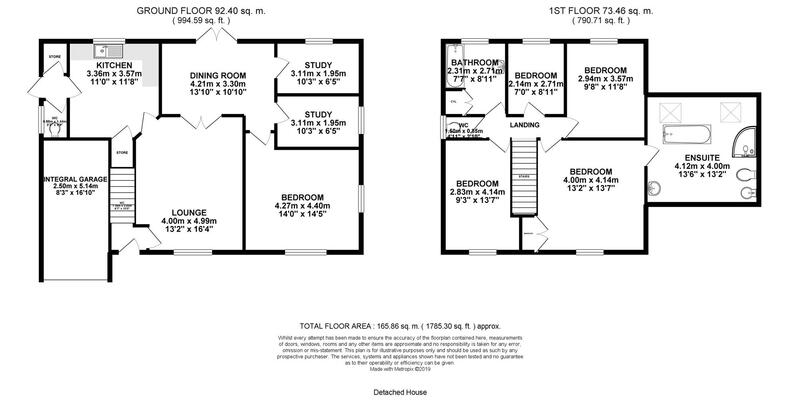 Briefly the accommodation comprises: entrance hall, downstairs WC, lounge, dining room off the lounge, breakfast kitchen, store room, two study rooms, five bedrooms with an en-suite bathroom to the master bedroom and a family bathroom with a separate toilet. Externally, there is a driveway with parking for two cars, integral garage and gardens to the front side and rear. Situated within easy access of the village centre which has a number of facilities including local shops, doctors, leisure centre and conveniently located via the major link roads to the Nottingham City Centre and the surrounding areas. Stairs leading to the first floor and door leading into the lounge. With coal effect gas fireplace with stone surround, bay window to the front elevation, T.V point, radiator, ceiling light fitting and two wall mounted light fittings, doors leading to both the dining room and breakfast kitchen. with tiled floor and doors leading to the downstairs w/c and store cupboard housing the gas central heating boiler. With a low flush W/C, window to the side elevation. French doors leading out to the rear garden, ceiling light fitting, radiator with doors also leading to both study rooms and bedroom five. Window to the rear elevation, radiator, ceiling light fitting. Window to the side elevation, radiator, ceiling light fitting. With doors leading to four bedrooms, bathroom and separate w/c. With built-in wardrobe, window to the front elevation, radiator, ceiling light fitting and door leading to the large en-suite bathroom. With two velux windows to the rear elevation, bathtub with tiled surround and hot and cold taps, enclosed shower cubicle with electric shower and tiled walls, low flush w/c, pedestal wash hand basin, ceiling light fitting, half cladding walls, bidet, radiator. Window to the rear elevation, ceiling light fitting, radiator. Window to the front elevation, ceiling light fitting, radiator. Obscure window to the rear elevation, pedestal wash hand basin with tiled splashback, chrome heated towel rail, bath with hot and cold taps with tiled surround, airing cupboard containing water tank and emersion heater, ceiling light point and tiled floor. Window to the side elevation, low flush w/c, tiled floor. The loft is boarded with shelving on both sides stretching the entire length of the loft which is accessible via a ladder through the trap door and is fully illuminated by two strip lights. Located on the ground floor as part of the side extension, with a bay window to the front elevation and another window to the side elevation, radiator, ceiling light fitting. This room is currently dressed as a large fifth bedroom but could also be used as a 2nd living room if preferred. 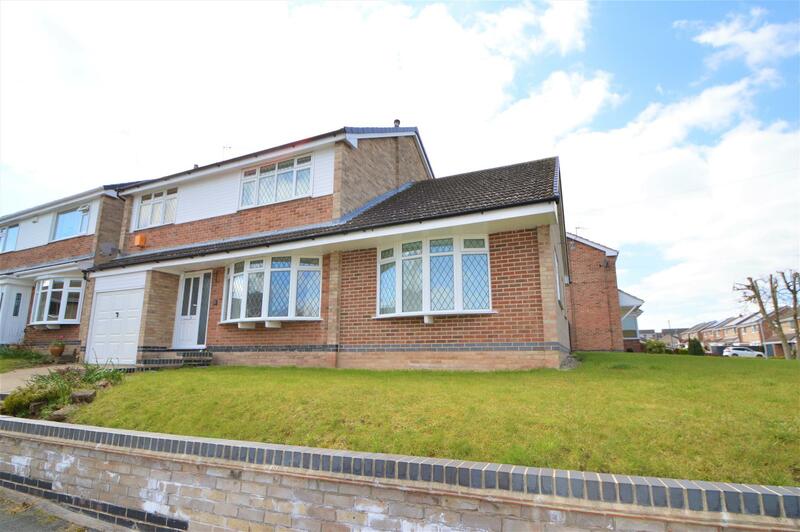 The property is situated on a large corner plot with a front garden mainly laid to lawn. The property benefits from a driveway for two cars leading to an integral garage. There is a side garden area which is currently laid to lawn and enclosed by a low brick wall. The rear garden contains a garden shed and is mainly patio and a stoney area. The local authority Rushcliffe Borough Council has advised us that the property is in council tax band D, which we are advised, currently incurs a charge of £1,890 (2019/20) Prospective purchasers are advised to confirm this.